Last year, I became familiar with Talking To Walls when I came across their album Naked, while shopping Amie Street. About a month ago, Brian Kelly (vocals, guitars, keyboards), Nathaniel Webb (guitars, bass, vocals, percussions) and Matt Krupa (drums, vocals) released a new body of nicely crafted work titled The Megan EP. The five song EP kicks off with the infectious "Song For Megan." 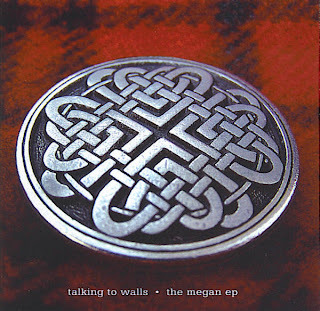 I'm not sure whether to call Talking To Walls brilliant or curse them for making a song so catchy I can't get it out of my head! Should I happen to hear this song live, I can envision myself flailing around frightening children, small animals and likely the band. This song alone was worth the price of the record and I couldn't wait to get my hands on it the moment I first heard it. It screams pub sing-a-long. The rest of the record is quite good too. My second favorite song on the record is the acoustic laced "Rollercoaster" which makes me feel like I'm sitting out on the back porch with friends singing songs on a Sunday afternoon. "Song For Megan" and "Crossed My Mind" are both from the upcoming album We Were Not So Tall. If these two songs are any indication, I'm in for a treat with the rest of the record. And for those in the New York area in need of a Talking To Walls fix, they'll be at Desmond's Tavern on March 7.